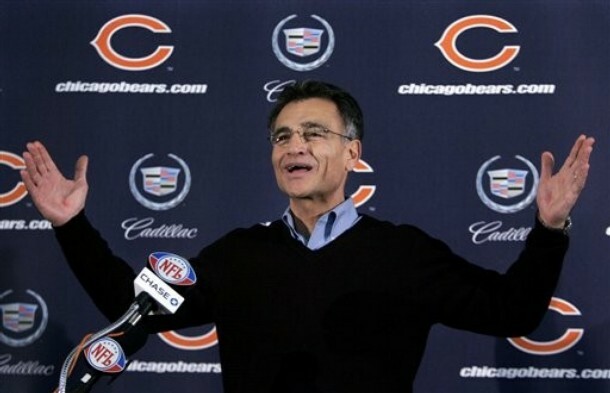 For years following the 1987 firing of General Manager Jerry Vainisi and through Mike McCaskey's reign of terror as team President, Chicago Bears fans clamored for the team to hire another GM. Current team President Ted Phillips repeatedly denied in 1999 and 2000 that a GM was a part of the organization's plans. Then following the 2000 season, Vice President of Player Personnel Mark Hatley and the team announced a "mutual parting of ways." Hatley was as close to a GM as the team had employed since Vainisi, and perhaps Hatley's failure forced the Bears to make drastic decisions. At the announcement of Hatley's departure Phillips first hinted that the Bears would consider all options-including hiring a GM for the first time in 14 years. After a strange vetting process that included employing an executive search firm to find the GM, Phillips found Jerry Angelo in the Bears' own division (Angelo had served for 14 years with the Tampa Bay Buccaneers). Ironically, Angelo's first year in Chicago (2001) resulted in the Bears' first playoff appearance in seven years. The team flamed out, losing their only playoff game at home, then posted a regular season record of 11-19 in the following two seasons. A playoff return happened in 2005, then the Bears appeared in the Super Bowl for the first time in 21 years in 2006. Then Chicago missed the postseason for three straight years, hosted another NFC Championship game, then had another disappointing flameout. Along the way, Angelo made some brilliant personnel decisions, made some horrible draft picks, some smart moves and boneheaded mistakes. To reflect on Angelo's eleven seasons in Chicago, we take a look back.